Francis Taylor – 37 years old. 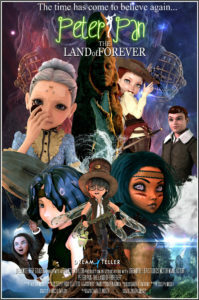 Francis, is responsible for almost all of the character development and story telling of Peter Pan: The Land of Forever. His talent and animation skill our evident throughout the website. His work has been nominated for and won animation awards from the “Out of the Can” film festival in both 2017 and 2018. He has worked with Ben Rush and Eugene Selasie creating the script for the screenplay.